iAsk: How long can the bubble of Chinese film industry last? The Chinese film market is too impetuous; we have to squeeze the bubble out. Since landed on the National Equities Exchange and Quotations (New Third Board), Happy Twist has been crowned as “Top Stock of the Drama Industry”. However, in less than three years later, Happy Twist failed to get listed on the Growth Enterprise Market (GEM). In April, it intended to terminate its IPO on GEM and withdraw relevant application documents. It indicates that Happy Twist calls an end to its nine-month IPO journey. Although the road towards IPO is not smooth, capital is capital, and business is business. From its first film "Goodbye Mr. Loser" to “Mr. Donkey”, the milestone of black humor movie, and then to "Never Say Die” of 2.2 billion yuan box office, Happy Twist with its objective of presenting drama from the stage to the big screen has earned both reputation and box office in recent years. One year one film, with such speed Happy Twist produces comedy with craftsmanship, and has become a producer of national quality comedy. But this also gives people more expectations and concerns about Happy Twist. Can Happy Twist that has saved the unhappy save the Chinese film market too? Will Shen Teng and Ma Li leave the company one day? What is the stumbling block for Happy Twist in the capital market? 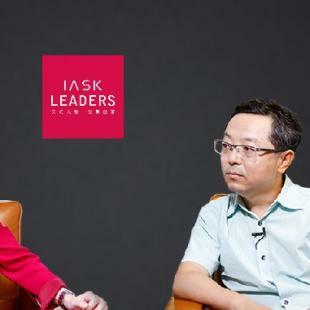 The tycoon invited by iAsk this time is Liu Hongtao, CEO of Happy Twist. Gloria Ai, founder of iAsk Media is having a talk with him about the worries of Happy Twist. Gloria Ai: People invest a lot in Chinese films. Everyone is seeking profit. But why are there still few good films with international fame? Liu Hongtao: Because the market is too impetuous; we have to squeeze the bubble out. Gloria Ai: What is the bubble of Chinese film industry? Liu Hongtao: Too many. For example, the prices of factors are relatively high: people, products, and services. These are extremely large bubbles. The cost of copyright and actors are high. So the prices in the whole industry are high. In fact, China is generally in a big bubble. Housing is an example. Gloria Ai: How did Happy Twist realize large-scale growth in these years? Liu Hongtao: We have grown very fast these years. Actually in early days, the film was seen as a plus. Our major business was still stage performance. It has always been our most basic source of income, the most basic business. For the development of the whole company, what makes it particularly valuable is that whatever I do, movie or variety show, it always makes me feel safe. I would have profits even if didn't earn a penny from movies or didn't start one single project. Gloria Ai: What is the motivation for Happy Twist to go public? Is it money? So that the founding team can cash out quickly and enjoy financial freedom? Liu Hongtao: Actually for us, going public is just our hope for the company to become safer and more stable. We are a private company. When we were small, we faced a lot of difficulties. There were many obstacles. We had a hard time. Gloria Ai: The listing of cultural industry or enterprises might not be the best choice, because it takes time for good works to get tested. Many good IPs are often passed down by family businesses. But the capital market demands speed and return. How do you make a balance? Liu Hongtao: When investors buy stocks and companies, I think they should see the future of this company, rather than the present. If I was doing a particularly good job now, but the company suddenly became weak three years later, it would be tragedy for everyone. You can see that the teams of our first three films were all new, including screenwriters, directors and leading actors. The same is true for the fourth and fifth film. Gloria Ai: Is this the rule you set? Liu Hongtao: No, it just happened. We have a very strong talent pool. Everyone should have a chance. As you can imagine, we are now producing one film one year, and these five groups of directors are taking off. They won’t make only one film in five years. In this way, the capacity of production will go up. Why are the investors so urgent? Gloria Ai: If you introduce new faces every year, will the old ones leave Happy Twist? Because they already have their own IPs, they can work for themselves. Liu Hongtao: In fact, every company is faced with such problems, and these will happen. For us, we pay particular attention to the feelings of everyone. We care whether they feel comfortable with each other. It is the same as marriage. If you don’t feel comfortable but still stay together, it will only create false harmony. Why has our team remained relatively stable and cohesive for so many years? It is because they are like-minded. Gloria Ai: How long do you think Shen Teng will stay with Happy Twist? Liu Hongtao: I think he will stay here for long. When asked by someone else, he said it would be indefinite. Gloria Ai: Just like forever? Liu Hongtao: Yes. He was among our first batch of actors. He was there when we had our first drama. Gloria Ai: Is he the biggest star of Happy Twist? Liu Hongtao: Of course, from the perspective of actors, yes. Gloria Ai: What are the other perspectives? Liu Hongtao: Directors, screenwriters. He has produced several dramas as director such as Somali Pirates. Actually in the formation of Happy Twist’s overall style and branding, he has made a remarkable contribution. There are many people trying to poach him in many ways, but he declined quite firmly.